A lot happens over coffee. True. Specially for coffee addicts like me. Addicted to filter coffee, not because it is from my country India, but it is like none other. If there is heaven on earth, then it must be in the kitchen where Indian filter coffee is brewing. Particularly so in South Indian homes. And the aroma of the heavenly beverage wafting from the kitchen gets your taste buds tingling, even before you take that blissful first sip. You think I am exaggerating? Walk into an Indian home in the wee hours of the morning, or early evening and you will know what I am talking about. Wait, just pause before you ring the doorbell ; an aroma is filling your nostrils, right? Walk in and you will get a cuppa, rich in taste and true to its aroma. So you loved it and you wish to ask for another cup, even as you are halfway through. But wait, you may not want another for sometime. 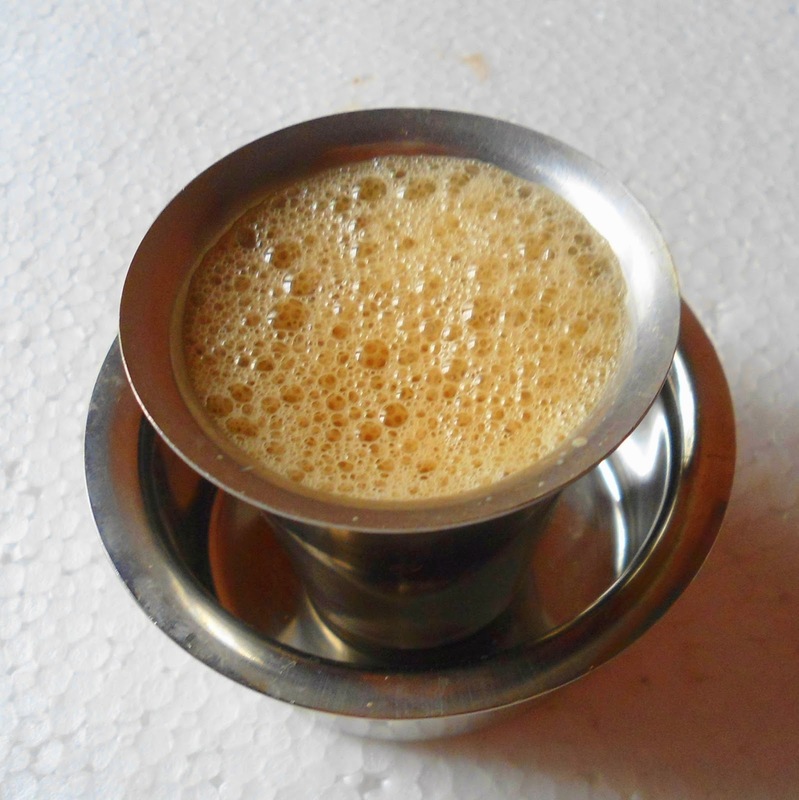 A cup of South Indian filter coffee is so satiating, you are probably crooning, ‘I am on the top of the world…..’!! If South Indian filter coffee is to be traditionally made and has to be as exotic as I am making it sound here, you will need a special metal device, looking like this. You can buy it at The Sandalwood Room. Head to Tras Street, pop in at this lifestyle boutique, pick up your Indian filter coffee set, that comes with an instruction manual and coffee suggestions. This coffee sounds divine, but is very simple to whip up. You may want to try it out ASAP !! The Sandalwood Room will help you with where to buy the coffee powder. 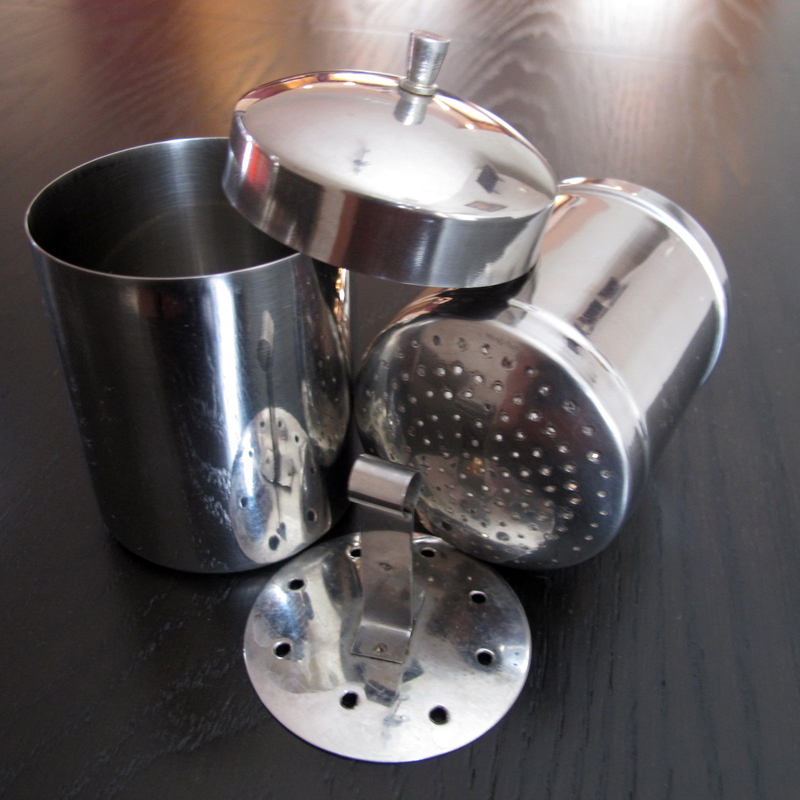 The device has four components – two cylindrical cups, a pierced pressing disc with a handle and the lid. The upper cup is perforated and is to be fitted into the lower cup. Now load the perforated cup with the required amount of coffee powder and gently spread it out evenly. Place the pressing disc on top of the coffee powder. Pour the required quantity of boiling water after the steam has settled down over the disc, close the lid and allow the coffee to drip into the lower cup. Voila ! It is magic in the making ! I hear a similar device is used to make Vietnamese coffee too. The resulting brew so gradually got from the device is generally stronger than the western drip/filter coffee, or even the espresso. Add boiled milk and sugar per requirement. Now for some more specifics. Traditionally, the South Indian filter coffee is drunk out of a stainless steel tumbler. Trust me, it enhances the taste. Not the same if you sip it out of a china cup. This is how it is served. Frothing hot coffee in the tumbler with the wide steel cup, the ‘dabarah’. South Indians love filling the coffee tumblers to the brim and they want it steaming hot. Now you get it ? Yes, the wide cup serves a few purposes. Mixing the sugar and the added milk thoroughly; cooling the beverage down to a sipping temperature and getting a frothing. Watch the south Indians pour the coffee back and forth expertly between the dabarah and the tumbler and take their first sip, you will know it is satisfying! It is a kind of cultural icon in Tamil Nadu, Karnataka, Kerala and Andhra, the four southern states of India. Coffee was introduced to South India by Baba Budan in the 17th century. Until the middle of the 20th century, traditional households used only jaggery and honey to sweeten coffee. I guess we can take a tip from that for health reasons, but the taste will certainly vary. Most commonly used coffee beans are Arabica and Robusta, medium roasted and finely ground. Best made with fresh buffalo milk. Back in our childhood days, the milkman would get the buffalo to our doorstep, milk the animal and give us jars of fresh frothy milk. Coffee beans were roasted and ground afresh every morning. But, gone are those days! It is winter now in India and a season of music particularly in the southern region. The Indian diaspora from all over the world travel to this region, to attend music festivals and eat mouth-watering traditional food during their stay. Cups and cups of the filter coffee are devoured at all times of the day. Like they say, ‘anytime is coffee time’! Saravana Bhavan is an Indian chain of restaurants found in most cities of the world. If you haven’t tasted South Indian filter coffee yet, that’s the place to go to. Some cities like Singapore and Kaula Lumpur have Murugan Idli Shop, another such eatery that has traditional vegetarian fare on their menu. 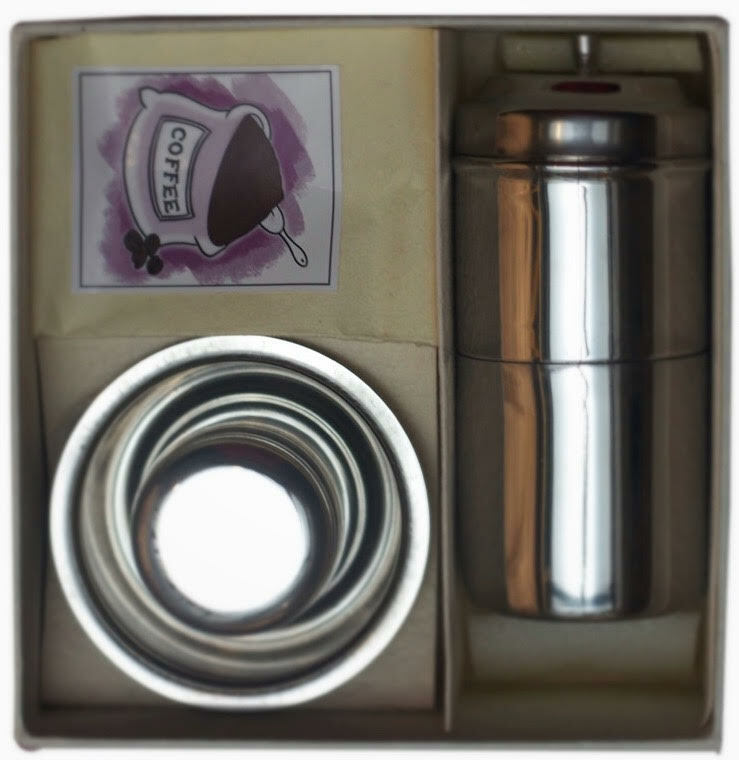 Ask your friends travelling to India to get you the South Indian filter coffee device and coffee powder. Here are some brands : Narasu’s, Leo, Cotha’s, Udhayam, Bru, Coorg and Kaapi. Singapore, Cotha’s and Coorg are easily available in the city. Lavazza will do as well. Or shop online. .
Fresh coffee powder, fresh decoction and fresh milk make a difference. Left over decoction, a no-no. Equal quantities of freshly roasted and ground Peaberry and Plantation A coffee beans are mixed for super tasting coffee. Just keep this in mind. Those staying away from India may not have access to these, but its good to know. If the perforated metal coffee filter is blocked, hold it over direct flame for 2-3 seconds, or clean out the holes with a pin and then use it. Even as write this, it feels good to know from an U.S study, that coffee drinkers may live longer. Google for more information. Everything in The Sandalwood Room is hand-made, hand crafted. In keeping with that, filter coffee hand-made and not machine dripped. ← Looking For Fine Dinnerware That Lasts, Singapore ? Thank you robynchristi , dilatoplusoy , Lindsay@ The Love Bungalow and Mad Cherry for liking my post ! Brilliant Article. Love the detail at which you have meticulously explained and elaborated certain aspects to brewing an Indian filter coffee. Thank you Srujan ! Once tasted it’s an addiction for life. I am so glad you are too. Recently I sent a filter coffee machine to Mumbai for a friend.